Successful Etsier and offline studio potter, Deb Babcock of Steamboat Springs, Colo., has worked with clay for seven years now, but each new piece often is her favorite. She admits, though, teapots hold a special place in her heart. 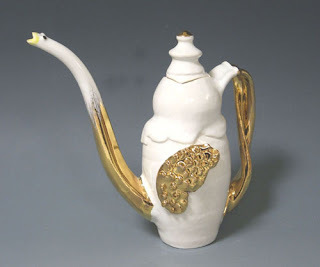 "I love making teapots because of the animation and personality that you can put into one," says Babcock, who started working with clay after she left a corporate job in Michigan. "I love working in clay -- it's very meditative." Babcock says. "I especially love working with porcelain on my wheel because it can be thrown very thinly and then altered in beautiful ways such as softly rolling over the rim on pieces. Glazes on porcelain are so clear and bright." Having studied under such renowned potters as Clary Illian, Meira Mathison, Sylvie Granitelli, Julia Galloway, Bonnie Seeman, Sarah Jaeger and Sandi Pierantozzi, Babcock says she is grateful for the the skills she's learned from each potter. "From each of these wonderful artists, I usually take away a new technique or way of creating that I then incorporate into my own pottery voice," she says. Babcock has taken classes at Anderson Ranch in Aspen, Colo., and at Laloba Clay Ranch, as well as some college courses at different universitites in the state. "What I've liked about each of them is their willingness to share techniques and their philosophies about the art we make. For the most part, they were all very approachable and down to earth despite being so well-known and sought after," Babcock says. "I'm still in contact with many of them." Living in a town of only 10,000 people, Babcock says she loves the extra reach Etsy allows her. "In terms of reaching people throughout the world, the comraderie among etsy sellers, and the opportunity to sell my work to such a wide audience," she says. Her advice to other Etsiers: "Communicate well with your customers; they like reassurance that the purchase they made from you was a great choice and that you'll stand behind your work. Promote yourself, because if people don't know how to find you, they can't see or buy your work." She has a Thomas Stuart electric wheel. "I throw standing up. And an L and L Kiln that I love." Babcock says she makes most of her own glazes and has experimented with layering the glazes to achieve some deep, rich color combinations. "I've recently started experimenting successfully with crystalline glazes, which require Lithium in order to grow crystals in the kiln," she says. "It happens that Steamboat Springs is home to one of only two above-ground Lithia Springs in the world (the other is in Germany). I use water from this spring to make my crystalline glazes." Babcock has words of wisdom for those who want to work in clay but don't have equipment: "Most towns (even small ones like mine) have art centers where you can go and use their facilities and equipment. If that's not available, go online and find classes or workshops you can take at art centers in other cities. Or, make friends with a local potter...she might let you use some of her equipment and/or fire work that you made at home!" Babcock says she loves hearing feedback from customers on Etsy, and with nearly 500 sales under her belt since she opened shop in August 2006, she's gotten many responses. "Probably the one that stands out most in my mind is a woman who bought one of my handmade cups for a friend who is going blind," Babcock remembers. "She told me that the feel of a handmade cup like mine would help her friend always be able to tell which coffee cup was hers even if she couldn't see it. Doesn't that make your heart race a little faster?" Babcock's work is available at http://dbabcock.etsy.com. She has graciously agreed to a giveaway. Here are the rules: For one week, from Nov. 17 to Nov. 24, anyone who makes a purchase from her shop and mentions seeing Babcock's profile on this blog will receive a porcelain holiday lapel pin. And the winner of the drawing among those who comment here will receive one of Babcock's dragonfly anything dishes. Alice is our winner! You'll receive your bowl shortly. Congratulations!